Just wanted to know how roof flashing is suppose to be installed. Can you guys take a look at these pictures and give me some feed back. My concern is the flashing installed over the shingles ? Sam that flashing is pretty standard for the area you are in. Agree, and sometime the roofer glues shingle tabs on top of the flashing to cover it up for aesthetics. Sam, when you look at flashing bear in mind that it needs to keep the water on the surface of the roof. 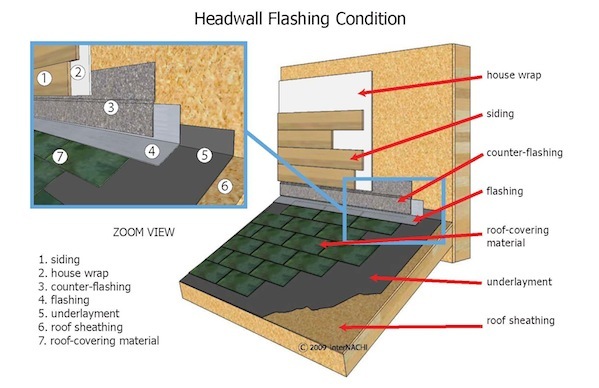 Headwall flashing that is installed under the shingles will route water under the shingles. Can't tell from your photo, but with asphalt shingles, the skylight sidewall flashing should always be step-flashing, not continuous. Counter-flashing is sometimes a concern with brick because often it's not bedded in a mortar joint like you see here, but is sealed to the brick with a sealant that eventually dries, shrinks and cracks, leaving an avenue for moisture to enter behind the flashing. We call that Z-bar flashing where I live. It looks to be correctly installed from the phone you shared, from my experience. It is used a lot around here to transition from stucco wall to roof on 2 story homes. I have a simple narrative that explains that the head wall flashing is sealant dependent and will need regular maintenance. During your inspection, you'll want to make sure the sealant is in good condition, and that there are no gaps. If there are nails, you will need to make sure they are sealed as well. Many times I'll find dried and cracking sealant, or bulges/openings were water can get through, or unsealed and rusting nails. In my area, I have never seen headwall flashing embedded into the wall. If those are fasteners through the base of the flashing attachment, it's wrong and will leak no matter how much sealant they put on it.